From the first glance at his debut album, Rahul Mukerji makes clear that one of his chief qualities is an open mind. The cover reflects both sides of his background (born in India and now based in the eastern US) and the music within follows suit. His expressive guitar playing through Ma De Re Sha demonstrates a dizzying range of technique and tone, while the compositions make a highly electrified fusion mix that borrows from Joe Satriani as much as John McLaughlin. These dynamic instrumental pieces stay most firmly rooted in rock mode, though it's an adeptly malleable one that always has room for exotic motifs. 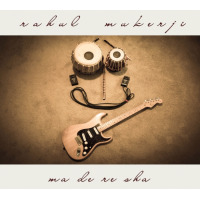 "I've always enjoyed the sound of tablas in heavy music and I decided to tailor the songs to that theme," Mukerji explains, and that flavoring does a lot to set this recording apart from the usual axe-slinger's shredfest. The supple hand percussion makes the disc's rhythms feel organic, even when trading with occasional electronic drum programs. Jazzy chord progressions are just as integral as heavy-metal chugging or Indian scales. If a few light-speed solos might risk getting too technical for some tastes, they're still hung on solid hooks and driving jams. The likes of "Children of I-2" and "Zidd" make appealing ear candy out of vibrant high-flying grooves, while the guitarist is elsewhere content to add dreamier parts behind some airy flute, or perhaps channel a little Black Sabbath in crunchy moments such as "Sinner." Mukerji's fretwork in any mode is fluid and buoyant enough to make his excitement contagious, and the result is an album happy to weave and blend all those elements until it's easy to forget they're so different at all. Track Listing: Exit 13; Sita; Fingerprints; Children of I-2; A Path Less Traveler; Zidd; Ma De Re Sha; Train Ride from Siliguri; Baisakhi; Hope Anew; Event Horizon; Sinner. Personnel: Rahul Mukerji: producer, arrangements, guitars, guitar synth, e-bow, sampling, tabla, drum programming; Bruce Ng: co-producer, arrangements, additional drum and percussion programming; Ruben Rubio: bass.